This post explains about import registration procedures to be obtained from Singapore government authority for importation to Singapore. How to get import licence in Singapore? What are the procedures for registration as an importer in Singapore? How to start an import business in Singapore? What are the certification formalities to import to Singapore? To import, the importer need to register the business with the Accounting and Corporate Regulatory Authority of Singapore (ACRA). The business, may be retail, must register as a sole proprietorship, partnership or a private limited company. After the business registered with ACRA, then activate Custom Accounts using ACRA assigned Unique Entity Number (UEN) and Singpass. UEN is a standard identification number for entities to interact with government agencies. Following, the importer have to be registered as a trader with Singapore Customs. As a trader, the importer will be able to apply for permits using TradeNet® for each shipment of goods. Companies must make an inward declaration for all goods imported into Singapore. The information provided here details on how to import goods to Singapore especially import registration procedures in Singapore. 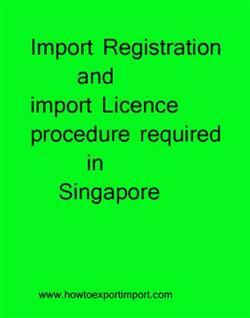 Import registration procedures required in SINGAPORE. Import Licence process in SINGAPORE. Process to import to SINGAPORE. Requirements of registration to import to SINGAPORE. Registration requirements in SINGAPORE to import. Registration needed to import to SINGAPORE. How can I register to import in SINGAPORE. What Licence requited to import in SINGAPORE. What should I do to import goods in SINGAPORE. How to get import licence in SINGAPORE. Procedure to get registration to import in SINGAPORE. Mandatory process need to complete import in SINGAPORE. First permission required to import in SINGAPORE. How can I start import business SINGAPORE?. How to begin import trade in SINGAPORE? Permission to initiate to import in SINGAPORE. The way to get registration to import in SINGAPORE.